written by a girl: what i'm reading..
As the nights draw in and the temperature drops, cosy nights in with a cup of tea and a huge bar of chocolate, along with a good book, are the way forward. The Opposite of Loneliness by Marina Keegan - I've heard so much about this book and the heartbreaking story that is behind it being created/published. Just 5 days after graduating from Yale in 2012, Marina Keegan died in a car crash, and so in memory of her, Marina's family put together a collection of her essays and stories, both published and unpublished. After all the rave reviews surrounding this book, I can't wait to read it for myself! These Days Are Ours - Michelle Hainoff - Having just started this, it certainly isn't what I had in mind when I bought it however after reading a review in Company magazine(booo, am I the only one really missing Company?! Plz come back!) 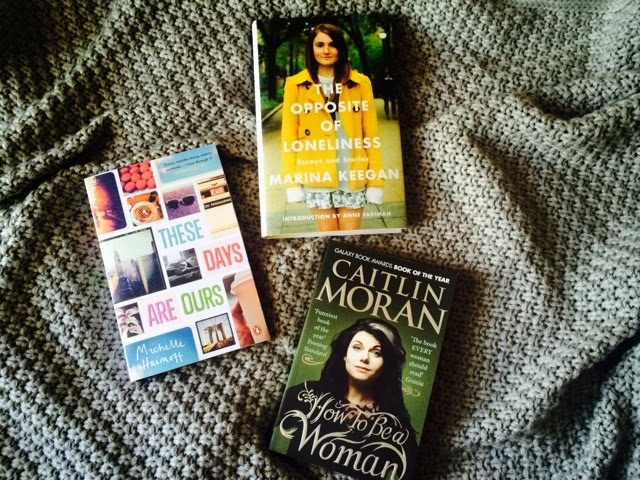 This endearing and easy read is about a group of rich 20 somethings, adjusting to life after the horrific 9/11 disaster - an ideal read to switch off your brain after a long day..
How to be a Woman - Caitlin Moran - Just finished this and oh my gawd, I love this woman so much. I seriously think every girl should read this and the Lena Dunham book, SO good and shows that every single female out there should be a feminist, with it being nothing to be ashamed of or embarrassed about at all. Such a fantastic writer and such an brilliant book. Read it, read it!